If you have a tendency of waking up with swollen, puffy eyes in the morning, then this sweet, warm minty mask is just right for your delicate eyes. In addition to eye exercises and some habitual practices to keep your eyes in a good condition, application of this mask will surely help relieve puffiness. It soothes and calms the undereye area and helps drain the lymphatic fluids that causes the puffiness. Chief ingredients include Tulsi (Basil) which acts as a refreshing tonic and mint that has the elements to soothe and cool. Make eyepads using either black tea bags soaked in warm water or cotton puffs dipped in witch hazel or celery juice and relax for 10-15 minutes. 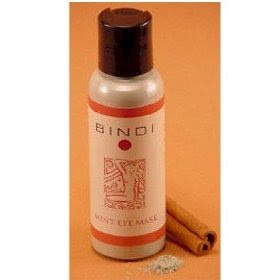 Then apply Bindi’s Mint Eye Mask to your undereye area. Leave it on for a few minutes and gently remove it with a cotton ball soaked in warm water. thanks for the recommend! i'll have to add this to my list of things to buy. Hi Kaolee, thanks for dropping by. :) Glad to know that you want to try this product. Keep visiting. Cool! I'd love to try this out!